+Zinio, named a Top Twenty App of 2012 by Techcrunch, is having a sweet special on their digital magazine subscriptions. Right now until March 4th you can get 2 years for the price of 1 on select titles! Boom. Whether you're a big magazine reader, or just have a couple subscriptions, or your wife is obsessed with tons of magazines full of stuff that always ends up on your honey-do list, now is a perfect time to give Zinio a crack. It's is a pretty smooth app that works on a variety of devices, as well as your desktop or laptop, so your zines' are right where you want them (or where your honey-do list creator wants them). To help make the decision even easier, Zinio has hooked it up with 10 free subscriptions to any magazine they carry! I will be giving them away here and all you need to do to enter is leave a comment and I'll select 10 winners based off some imaginary criteria I'm making up in my head right now. Clearly you'll need to not comment anonymously or I'll never be able to find you in the vast depths of these intertubes... and your winning entry might go forever unrewarded </tears>. If all ten remain unclaimed I will take one for myself, cause that's how I roll. Thousands of top magazines from around the world. Post your comment below to enter and good luck nerds! Download Zinio for Android from Google Play and for iOS from iTunes. 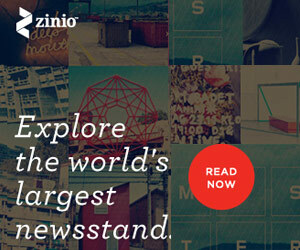 Visit zinio.com to learn more about their subscriptions and content. Update: Contest has ended. Congrats to our winners Gregg, Traci, Jessi, and John! I rarely know what you're running on about, but I saw free, and that's my favorite flavor. Hi Kim, unfortunately this contest has ended and winning entrants have already been notified. Stay tuned for more giveaways and fun!